Maentwrog might not be a seaside village but it is on the Wales Coast Path, at least until the new Pont Briwet is built further downstream. Having come this far inland, to the tidal limit, it would be a shame not to explore further. The Vale of Ffestiniog Way is an eighteen mile walk that goes up one side of the vale then on to the highlands behind Manod dropping into Blaenau and down along the other side of the vale to rejoin the coast path. You will be amazed at what you will see in such a short time. You can start from either end but for me the more spectacular route is the steep descent of the quarrymen into Blaenau and then following the slate journey on or alongside the Ffestiniog Railway towards the sea. The top deck of the 1B double-decker bus from the Oakeley Arms to Llan Ffestiniog provides instant lift and great views. The first and third sections are not difficult for anyone doing the coast path but the middle section should be treated with care, especially in misty and extreme weather conditions. A good map is essential. It is well worth reading the Mountain Safety Advice provided by the Snowdonia National Park. Click here. If the weather is really bad there are low level footpaths linking Llan Ffestiniog with Blaenau and of course the first velorail in Britain .... but I suspect you can’t hire that for a one way journey! Outline: this leg of the VoFf Way takes you across the valley floor then up the steep sided Cynfal gorge with rock pools and waterfalls surrounded by oak woodland. Then through fields and into the historic village of Llan Ffestiniog with its community pub. Maentwrog church is a good place to start, with the village name clearly explained by the stone (maen) thrown into the churchyard by the giant, St Twrog. He was cross that the locals were reverting to paganism and, in the 6th century, lobbed a boulder from Moelwyn Bach, the 710m peak across the valley. Our pagan ancestors revered yew trees and these in turn were embraced by early christianity to help ease the process of conversion. The massive yews in the churchyard have an official certificate, issued by the botanist David Bellamy, confirming them to be more than 1300 years old. St Twrog’s church is in good condition, rebuilt and extended at a cost of £3,000 in 1896 by the Oakeley family, whose mansion, Plas Tan y Bwlch, overlooks the village built for their workforce. It’s said the villagers were asked to refrain from hanging out their washing on a Monday lest the sight of their bloomers spoilt the view for posh guests at the Plas. At the end of the field turn right onto a narrow lane just opposite Bronturnor, a grand looking house and former rectory built in 1826 for the sum of £957. The stream that flows past the house and into the Dwyryd is the route taken by the Wooden Boulder, a large sphere carved from the trunk of an oak tree by David Nash and washed downstream by successive floods until it got wedged against the bridge. After a helpful lift across the lane by the council it spent many happy years in the Dwyryd, going out and returning on the tide, before vanishing into the Irish Sea in 2003. I have heard reports that it has been seen in the estuary again. Follow the lane past two farmyards (NB loose dogs at the furthest farmyard) and over the beautiful stone bridge at map reference 685416 with pedestrian passing places. Behind you at the base of the vale is Plas Dol Moch, a 16th century house acquired by Coventry City Council in the 1960s and run as an outdoor education centre. After the bridge the river on your right is one of the tributaries, the Cynfal, that brings water steeply down from the wild moors. At the house named Tal y Bont (B&B) turn right onto the main road and walk past the junction to the end of the road bridge over the Cynfal and take the marked footpath up the southern side of the Cynfal gorge. Walk upwards through woodland keeping the river on your left until you are at eye level with the church of Llan Ffestiniog. Follow the path onwards until it drops down into the gorge crossing the river on a gated footbridge at map reference 705411. There are great waterfalls, rock pools and vivid greens that come with the high humidity. Follow the path downwards to Huw Llwyd’s Pulpit - this is a pillar of rock rising out of the waters of the gorge and said to be where the 17th century sorcerer used to stand on the rock to recite poetry, preach sermons and converse with spirits. He claimed he was safe from evil while on the rock because the devil was afraid of water. A little further downstream is Rhaeadr (waterfall) Cynfal with a safe viewing platform from which to peer into the deep gorge. 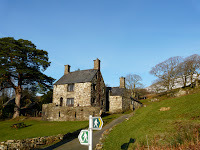 Walk up from the viewing platform to the gate that takes you out of the woodland and follow a path through fields to the village of Llan Ffestiniog where the Llan (church) stands proud and visible from most parts of the vale. St Michael’s was built in 1844 and the earliest church is thought to have been established in the 8th century. Its most famous rector was Edmund Prys (1543-1623), also archdeacon of Meirionnydd, and who is remembered for publishing the psalms in Welsh and the first Welsh book of hymns. After so many years of worship the church is on the brink of closing. Just across the square is the welcome oasis of Y Pengwern. This 300 year old pub closed in 2009 and was recently bought by the locals. It re-opened as a community pub in 2011 and is being redeveloped in stages. As well as the bar the restaurant is now open and in the future accommodation will be provided. Click here to go onwards up the Roman road behind the mountain that housed the National Gallery in WWII and down to Blaenau Ffestiniog. Outline: this leg of the VoFf Way takes you up the Roman road (Sarn Helen) past an iron age hillfort to the entrance to the slate mine where the treasures for the National Gallery were safely stored during WWII. From here you follow a slate tramway across rugged terrain descending steeply into Blaenau with industrial heritage all around. From Y Pengwern walk out of the village on the A470 road towards Trawsfynydd going underneath the railway bridge. About 100 metres beyond the bridge at map reference 705418 take a footpath to the left and follow it up through the fields on to the golf course keeping towards the right hand side and watching out for flying golf balls. This course is neither busy nor expensive but quite steep and with great views. Exit the golf course at a gate at map reference 719421 turning left and walking up a narrow lane to the B4391. Turn left and then right at map reference 723423 onto the track to the water works. On your left are some pillow mounds which are referred to as Beddau Gwyr Ardudwy - the graves of the Ardudwy Men. The story goes that the men of Ardudwy needed to increase their population so they stole the women from Clwyd. Somewhat peeved, the men of Clwyd attacked and killed the Ardudwy men but the kidnapped women did not rejoice. Instead they drowned themselves in the nearby lake, Llyn Morwynion, the Maidens' Lake. At the left hand side of the track as it passes the water works there is a replica of a 5th century carved stone which reads Cantiorix Hic iacit, Venedotis cives fuit, consobrinos Magli magistrati - Cantiorix lies here. He was a citizen of Gwynedd and a cousin of Maglos the magistrate. Venedotia is the old Latin name for the territory of Gwynedd. Presumably the Romans were long gone from Britain but their language and ways of doing things had been adopted by local people? At map reference 726428 the track branches to the right. Follow this for a short way, maybe 350 metres, then scramble up left to the top of a small hill on which is an iron age settlement called Bryn y Castell (map reference 728430). The site was excavated and researched in the late 1970s by the Snowdonia National Park and more information on what was discovered can be found on the Park’s website. Walk off the northern end of the settlement’s hill and along for 350 metres or so crossing the Afon Gamallt on a footbridge by a ford (‘Rhyd Helen’ which is mentioned in the Mabinogion) at map reference 729433 and carry on in a relatively straight sort of Roman line. You are walking along Sarn Helen; Sarn is the Welsh word for causeway and Helen is thought to derive from yr lleng, the Welsh for the legion i.e. causeway of the legion. A short diversion off the Roman road to the right to map reference 736442 will take you to some hut circles. Follow this upland Roman road, keeping the fence on your left hand side, until you reach the stile at map reference 737444 then cross over and continue, keeping the fence on your right, until you reach the conifer plantation at map reference 739453. From here make your way northwest to the quarry car park at map reference 733457. From the quarry car park (handy dropping off or parking space if you don’t fancy the uphill stretch) follow the level tramway to the north past a derelict TV aerial shelter and turn left onto the next tramway at map reference 734460. Keep going to the disused Cwt y Bugail quarry and veer left or west going past Llyn Bowydd and Llyn Newydd – these two reservoirs stored water to power machinery in the slate workings below. Follow the footpath towards Llechwedd Slate Caverns (a great place for going underground to experience the good old days of slate mining) until you reach map reference 712468. At this point you are only about 100 (steep) metres away from another footpath at map reference 712467 which will take you down to the centre of Blaenau Ffestiniog. There is no public right of way and no signposts connecting these two paths but the landowner, Llechwedd Slate Caverns, is working with us and the council to make it a permissive right of way. In return we are all asked to stick to the path and not go wandering about in the quarries. 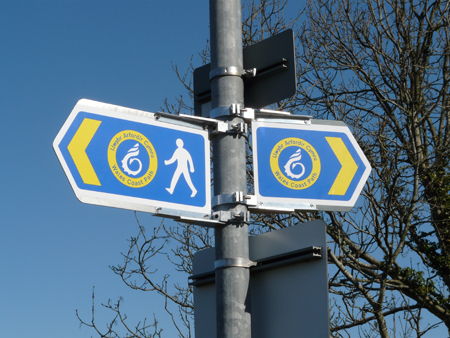 Once you are on the path that starts (or ends) at map reference 712467 follow it down, down, down until you come out in the centre of Blaenau Ffestiniog with the Railway Station across the main road. Click here to go onwards down the railway side of the Vale of Ffestiniog. Outline: this leg of the VoFf Way takes you gently down the railway side of the valley past pioneering hydro electric reservoirs, rock cannons, Britain's only railway loop and through pristine nature reserve where wolves roamed only 400 years ago. If you're lucky you might see some wild goats. If you’re not catching the train walk northwards from Blaenau Ffestiniog railway station along the main street being careful not to trip whilst reading snippets of Welsh poetry in the pavement. At the roundabout turn left and follow the main road around two 90 degree bends then turn right along the wide track between the playing field and Blaenau’s new allotments. Just after the corner of the allotments turn left up a small lane between two houses and follow it through the housing and turn left onto Glanypwll Road. Follow this downhill for a couple of hundred metres before turning right and crossing the Ffestiniog Railway on a footbridge at map reference 692459. At the other side of the bridge turn left and walk upwards through a gate in a fence and at map reference 689457 go through a gate in a wall. Keep following this rough path through a kissing gate at map reference 686454 and a gate over a tramway. On your right hand side is a great example of 'crawiau' which is traditional slate fencing. After yet another gate at map reference 685453 walk down to Cwmorthin Road and turn left for about 100 metres until you see a sign on the right hand side marked Lle Chwarae (Play Ground). Follow a narrow lane alongside a terrace of cottages and at the end veer towards the left and downhill along a path through brambles crossing the railway line by Tanygrisiau Railway Station and join the road at map reference 684449. A short way to your right is the Lakeside Cafe. From Tanygrisiau railway station you have the option of going either side of the reservoir but I recommend the eastern side which gives better views of the mountains. Walk along the dam wall until almost the end then follow a slipway down to the base of the wall. A small footpath turns down to the left with steps onto the gully below – cross the gully (unless water is being released) then up the steps the other side and follow the path to the end of the wall. Cross the stile and follow the path to the southern tip of the reservoir. There are different routes that are self-evident depending upon the height of the water. This reservoir captures the water that is pumped up to Llyn Stwlan, generally overnight, then released through four generating units providing enough electricity for north Wales for several hours. It is the first major pumped storage hydro electric station to have been constructed in UK. The underlying principle is a bit like a battery using excess electricity (use it or lose it) in times of low demand to send the water uphill and release it when demand is high. I think the ratio of input to output is 100 to 70 i.e. you get back 70% of what you put in, which is better than losing the lot! When the water level is low you can see the different trackways of the Ffestiniog Railway. Coming from the power station to the southern end of the reservoir is the original track opened in 1836. Wagons came downhill from Blaenau and then had to be pulled uphill by waterwheel and this caused a bottleneck of traffic. By 1842 the new route through the tunnel was opened thereby enabling trains of wagons to operate by gravity all the way to the coast. A rock cannon was drilled and fired to celebrate the opening of this tunnel. You can find the seventeen hole rock cannon at map reference 67804328, a slab of rock angled towards the reservoir, about forty metres to the east of the uphill track as it levels off. If you want to know more about their history and operation you can find out more by clicking here. This track was used for over a hundred years until the railway ceased operating and, with no prospects of it re-opening, the Central Electricity Generating Board (CEGB) plugged the tunnel and flooded the line to build the bottom reservoir. The subsequent legal battle the railway and CEGB lasted over eighteen years but eventually compensation was paid enabling the current tunnel and higher track to be built. These days the back of the power station is the highest position on the track from which to travel to the coast by gravity. Carry on walking along the original track and at the end of the tunnels you can see the impressive dry stone wall on which the 1842 track was laid. Keep on until you reach Dduallt Station. It’s Mecca to rail enthusiasts, the only railway loop in Britain, the only narrow gauge loop this side of India. The loop enables thirty feet of altitude to be gained without increasing the gradient – this cunning solution to the flooded track enabled the same power engines to run the same size trains. Cross beneath the railway line down to Plas y Dduallt, built in the 1560s for the Lloyd family, descendants of Llywelyn the Great. The house at the front with large central windows was added in 1604 (beams have tree ring dated to between 1600 and 1604) and the arrow slits, beneath the balcony, by the eccentric Colonel Campbell in the 1960s. He is most famous for having his own engine, called the Colonel, which he parked in a siding and drove as part of his daily commute to the office. In those days there was no vehicle access to the house. The siding has gone but Campbell’s Platform remains as a private halt for the house and guests at its self-catering cottage. In the late 1800s there was a thriving Sunday school here. More recently the house was used as a location for an overnight vigil by the Most Haunted team; there was much banging and screaming in the programme. 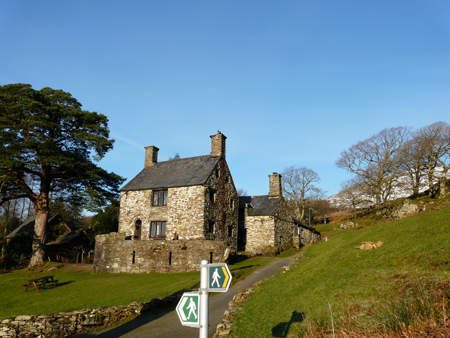 Follow the footpath (not the tarmac drive) into the Maentwrog Nature Reserve. This part of the reserve is called Coed y Bleiddiau, ‘forest of the wolves’, ancient woodland where the last wolf in Wales was allegedly slain. 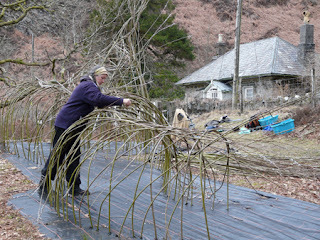 About fifteen minutes into the reserve is a cottage, also known as Coed y Bleiddiau, and opposite which is a larger than life howling wolf planted with several hundred rods of willow. The paling fence that surrounds it is a temporary measure to protect it from the wild goats; once established the fence will be removed and children will be able to crawl into the belly of the wolf and exit through the long tail. The cottage itself was built for the railway inspector in the 1860s shortly after the line was upgraded to steam power. Over the years it has had many tenants including St John Philby, father of Kim Philby the spy, on a ten year lease from 1937. Philby’s guest at the outbreak of WWII was William Joyce who travelled from here to Berlin and became the propaganda broadcaster Lord Haw-Haw referring to the area in his broadcasts. It has been empty since Bob and Babs Johnson left in 2006 but hopefully some kind soul will take it on. Landmark Trust maybe? Continue along the path and take the left hand fork into the conifers going downhill towards the coast, go past a cottage called Ty Coch, down its driveway and turn left onto the road with The Oakeley Arms on your left hand side at map reference 660409. You are now about eighteen miles and only ten minutes away from where you started, ready to resume the coast path.